Irrespective of the programming language or framework used, Obeying the Testing Goat is essential and leads to reduced error-prone programs or applications. Let’s put Mocha, Chai and Chai-HTTP to use and see how we can test an Express API endpoints behind authentication. As much as testing is generally not fun to write, we all appreciate the benefits. Fortunately, I’m not here to tell you what goodness testing comes with, and how it can improve your code base if you have good test coverage. In this article, let’s explore how to handle testing API endpoints which are protected. In our setup, we’ll be using JWTs, therefore, a way to maintain the JWT in subsequent tests without refreshing is important, in order to pass a flow. If you’ve played with Express before, then that’s fine. In any, I think developers interested in testing know their way around. So let’s get in now that we have our needed packages installed. I won’t go over the steps for 1. and 2. as the third point will take us through all that, and throw in the accessing a protected route, namely, /GET user, which returns a User info. // Do a verification_token 'distin' here. 'msg': "Missing credentials. Provide 'email' or 'username' AND 'password'"
Nothing interesting happening in the above snippet though. We’re logging in! First of all, add something small to your package.jsonfile indicating a command to run the test. "test": "mocha --timeout 3000 --recursive"
With the above in our package.json file, we can simply do, npm test to trigger the running of the test. But we even have no test file yet. // the property, res.body.state, we expect it to be true. done(); // Don't forget the done callback to indicate we're done! Now, go back and read through the code, isn’t it just beautiful, how writing tests with Chai mean we get to use common English expressions. To be able to log in, we need to have an account. Therefore, we create an account, then login, then extracting the auth token, we make a request to the protected page/endpoint. We signal the end of our tests with the done() callback. Indeed, we’re done! Nesting your a request, yet in the .end( .. ) chained sections means we get access to the either err or res objects from the previous request. With that, the rest is history. We get to manipulate our res object just like we do in usual Express. Nothing special. All our tests passed. Don’t say because I say it passed, it passed for you too. Play with the examples above. Create your own tests, as I have in my test results above. You can decide to test different scenarios of your application, thus, if something doesn’t go right in future updates and code increments you can pick them up easily. 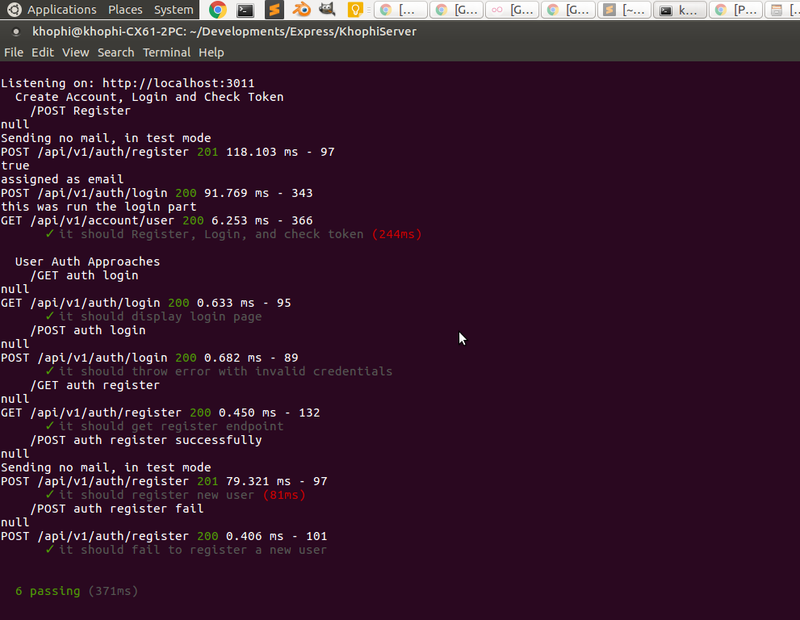 Writing test.should.be.fun and using Chai and Chai-http makes the experience easier. I hope to write more tests for my upcoming Progressive Web App, which will live at khophi.com. It is from the codebase of the project which the above snippets were taken from. Hope to you see you in the next one.